You may have heard that the ukulele is one of the easiest instruments to learn but what is the best ukulele for a beginner? That’s what we set out to find. We researched some of the best-selling brands and top-rated models and put together this review so you can see the best of the best, all in one place. Before we get started, let’s take a look at some of the key features to keep in mind. Type: There are a few types of ukuleles: soprano, concert, tenor, and baritone. Soprano is the most common but the larger ones are great to learn on, too, because there’s more room for your fingers and they’re easier to hold. Material: Most of these instruments are made of wood, commonly mahogany, basswood, or maple. The body, neck, and fingerboard aren’t always made of the same material, though. We also found a great plastic option that’s a perfect choice for young children. Pieces: Some of these ukuleles come with a lot of accessories that are perfect for a beginner. You’ll find straps, picks, and extra string. You’ll also find a lot of great instructional materials, like booklets and access to online videos. Case: A case is pretty important because it’s the only way to store and transport your ukulele safely. It not only protects the finish but also prevents the tuners from being bumper or the strings from accidentally getting plucked. 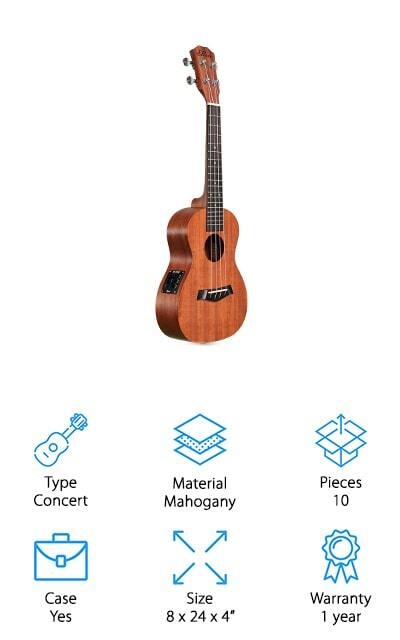 Size: Size goes hand in hand with the type of ukulele you have. A soprano uke is the smallest, then concert, tenor, and baritone. The larger the uke, the more room you’ll have for your fingers and hands. Warranty: While not all of our picks are covered with a warranty, most of them have some kind of coverage. A few even offer money-back guarantees in the first month if you’re not satisfied. Details are in the individual reviews when applicable. Now that you know what to look for, let’s take a peek at our top ten picks. If you’re in a hurry, start with our top and budget picks to get an idea of the range that’s available. We put them right at the top of the list so they’re easy to find. All of these products are really great, though, so stick around if you can. Want to find out what's the best beginner ukulele? Let’s get started. Kala is one of the best ukulele brands for beginners so it’s no surprise to find it in our top spot. The Kala Baritone Ukulele comes with a bundle of everything you need to get started playing right away which makes it great for anyone just getting started. The ukulele itself has an Agathis body with a smooth satin finish and a mahogany neck and a rosewood fingerboard and bridge. You also get a gig bag, digital tuner, polishing cloth, high-quality Aquila strings, a strap, and an instructional DVD to get you started on the basics. You’ll learn how to set up your ukulele, tuning, and how to play basic chords. This is a beautiful ukulele with 18 brass frets that’s a great one to get you started. Next up is our budget pick, the ADM Ukulele Soprano, the best beginner ukulele to buy if you’re looking for the best value for your money. The basswood fingerboard and bridges are sturdy and smooth so your fingers glide along easily as you play. It includes some great accessories, like a waterproof carrying bag, a clip-on tuner with LED display, a polishing cloth, and an extra set of strings. There are also fingerboard stickers that you can place to help you learn where to place your fingers when you’re just starting to play. This uke is also covered with a 100% money back guarantee for the first month and a 1-year warranty that covers any manufacturer defects. One more thing, this one is available in 8 different fun colors. Another great pick for best beginner ukelele is the Donner Concert Ukulele. This is a traditional concert style instrument that has a gorgeous mahogany body for a rich, loud sound. Concert ukuleles are slightly larger, clearer, and louder than soprano ukuleles and, honestly, this one really delivers when it comes to sound. The fingerboard and bridge are comfortable when you’re playing while your fingers glide easily across the 4 advanced carbon nylon strings. This ukulele features 18 brass frets and chrome-plated tuner so you can get a consistent, accurate sound. 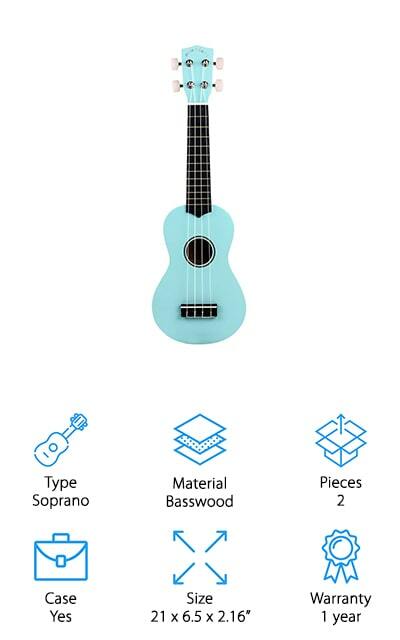 There are a few other things included that make this a nice set for beginners including a ukulele strap so you can easily play standing up, a set of strings, 4 guitar picks, and a high-quality carrying bag for easy transportation. If you’re looking for the best beginner tenor ukulele, this one from Hricane is a great choice. Tenor ukuleles are one of the larger ukuleles which means that the frets and strings are farther apart than on a soprano uke. This makes a tenor a good choice for people with large hands and fingers, especially when you’re first learning. The Sapele body and neck along with the rosewood fingerboard bring a beautiful, professional look to this instrument and a durable carrying bag is included to keep it protected when not in use. It comes with 4 advanced carbon nylon strings that are easy for your fingers to slide across and the 18 brass frets and marking make it much easier to learn how to tune it accurately and how to place your fingers for different cords. The Hola! Music Ukulele Bundle is an awesome choice for the best ukulele for beginners. One of the coolest things about it is that it’s available in 10 different colors. That doesn’t really affect how it sounds but you’ll probably be more inclined to practice if you have a fun color that you love. This is a great choice for beginners because it comes with 2 months of live video music lessons where you actually interact with an experienced instructor. The body of this uke is made of maple while the fingerboard and bridge are walnut. There are also 12 silver nickel frets with easy markings for tuning and learning cords. Premium Aquila strings are also included to deliver the best sound possible. It also comes with a strap, 3 picks, and a canvas tote. What's the best ukulele for a beginner? This Diamond Head Ukulele is a great choice. The strong maple body and neck are durable and comfortable to play. It comes in 13 different colors that include bright shade like yellow, red, and pink as well as some toned down options like black, brown, and white. Each color also features a high gloss finish for easy polishing and long-lasting durability. Gear styled tuners are easy to adjust and a matching gig bag is perfect for travel. The shiny frets make tuning and playing easier and the simple tie-one bridge is perfect for easy string changes. If you want to start playing and you don’t want to invest in a more expensive instrument but you want something superior to a toy, this is a great choice. Next up is the Kangaroo Ukulele, a soprano size that’s small and great for small hands and fingers. While this is a real instrument and not a toy, it’s a very kid-friendly option because it’s made of durable plastic and faux wood. That said, it’s a great option for anyone who’s just getting started. It comes with geared tuners and premium string as well as an electronic tuner, strap, picks, and a carrying case but saves you the larger financial investment of a handcrafted wooden instrument. You also get an instruction booklet that includes a songbook for when you get a little more confident in your ability. Whether you’re looking for a gift for a musical child in your life or you want to learn without making a large financial investment, this is a great choice. The Ellen Electric Concert Ukulele is a perfect size to start learning with because it’s slightly larger than a soprano which makes it a little easier to figure out where to position your fingers. While this is an electric ukulele, it comes with everything you need for both electric and acoustic play. The mahogany and rosewood construction looks amazing and is made to last while also bringing a rich, warm sound. This kit comes with a small amp and audio cable, padded case, strap, an electric tuner with LCD backlit screen, 3 picks, and a spare set of nylon Aquila strings. If you want to play acoustically, just pick it up and play normally. When you’re ready for all the world to hear you, plug it into the amp and go for it. Our last pick for best beginner ukulele is the POMAIKAI Soprano Ukulele. It features a high-quality basswood body and black hardwood fingerboard for the best possible sound quality. This soprano size is small, lightweight, and easy to carry around plus there’s a case included to protect it from any damage while on the go. The fingerboard is smooth and the frets were designed so as not to scratch your fingers. Combined with the flexible nylon string, they create a smooth and easy playing experience. This uke comes with a 60-day money back guarantee as well as a 1-year warranty against any manufacturer’s defects from the date of purchase. One more thing, this instrument is available in 7 different colors so you can pick one and make it truly your own. The AKLOT Beginners Concert Ukulele features a solid mahogany soundboard for a soft, clear sound with warmer tones than you can get from a laminated one. It also gives better resonance and a more stable sound. Copper gears allow for smoother and more accurate tuning that lasts longer than zinc alloy or other metals. This ukulele includes Aquila strings and a strengthened neck and soundboard that add more durability. You also get a lot of beginner bonuses with this uke, including an instruction booklet, cleaning cloth, 2 felt picks, strap, and case. That’s not all, AKLOT also provides access to beginner videos on their website where you can learn about everything from cords to strumming and more. There are 9 lessons in all and they’re an interesting way to start playing or to learn a little more about your craft.